"Absolute Home Improvements did a great job with my roofing project"
"Great job at a very fair price"
"Impressed with the speed and efficiency"
"They were an efficient, conscious, courteous and hard working group"
"They helped me all the way through the renovation"
"Absolute Home Improvements is now the only company I will ever use"
Absolute Home Improvements Inc. was founded in 2005 by President Sam Bickhart as Absolute Roofing Incorporated. Our premiere focus was roofing, gutters, chimneys, siding, windows and doors. In 2007 we started growing, so we did a name change and became Absolute Home Improvements Inc. and expanded our services to decks, fences, remodels, insulation, flooring and more. 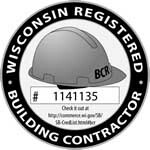 Our main goals as a Milwaukee contractor are to provide you with excellent customer service with outstanding installation at an affordable price. We strive to be the best priced Milwaukee contractors and when were not, we offer our “Price Match Promise”. That means we’ll meet it and beat it. Besides our price our warranty is like no others offering a “Lifetime No Hassle Workmanship Warranty”. All of this helps builds strong relationship with our customers and keeps them happy for years to come. Please take some time and take a look at our testimonials and project photos. © 2008 by Sam Bickhart of Absolute Home Improvements Inc. All rights reserved.